The complexity in Greater Seattle’s Transit system can intimidate visitors. In other cities, the rail system is a comprehensive and comprehensible means of getting around. In Seattle, you must use buses if you wish to get out into the neighborhoods, including major tourist attractions. Get yourself an ORCA card. We mean this. Yes, it costs you an extra $5, but it will save you a ton of headaches dealing with a thicket of fare policies, overlapping agencies, and transfer rules. An ORCA card is kind of like a cash card, but there are also various kinds of passes you can put on it. If you’re going to take several trips a day, or trips into other counties, the $8 day pass may pencil out for you. Otherwise, as rule of thumb, $6 a day should be enough if you plan to travel around on transit, in addition to the $5 fee for the card. You can always add more fare at any rail station if that proves to not be enough. If you’re planning ahead, your best bet is to order by mail. This is especially the case for child ORCA cards, which are inconvenient to get in person (see below). 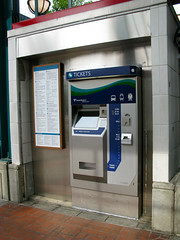 If you aren’t planning ahead, ORCA cards can be purchased from machines at any light rail or Sounder (commuter rail) station, plus some other places. There is a light rail station at the airport; if arriving by Amtrak, there is a machine on the commuter rail platform in King Street Station, which requires you to exit the station. Here’s the complete list of locations, and they’re also on the system map. Many of those locations also allow you to add value to your cards. Kids 5 and under are free on transit. If you are 65+, you can buy a reduced fare ORCA by showing up in person during business hours here. If you’re low income, you can jump through some more hoops to get a reduced fare ORCA. All of these special fares are half the adult fare or less. In all honesty, the mail-order youth ORCA is probably the only one worth the trouble, unless you are really pinching pennies. The Seattle Monorail is cash-only, so it’ll cost you $2.25 each way. You can use ORCA on the ferry system, but it’ll cost you on the order of $7 round-trip. If you’re trying to plan a very specific trip at a specific time, you can try Metro’s trip planner, available on the web and as a mobile app. It doesn’t always come up with the best trip, but it will get you there. It’s also pretty sensitive to things you put on the form, like how far you’re willing to walk, so use it with care. Google Maps also will give decent directions, and do so with a much more graphical interface. Anecdotally, I’ve had much more success getting decent directions using Google Maps for transit directions than the trip planner. Transit is a popular app among our readers, and it now integrates with services such as Uber and Car2Go. For more ad-hoc navigation, you have to use a system map. King County Metro’s maps are much improved, but there are far too many routes for it to be very easy to use. Instead, for travel in the city proper use the Seattle Transit map we put together, which makes it easy to pick out the routes that run frequently, and therefore usefully. If you’re venturing out of Seattle, the Sound Transit system map isn’t perfect but at least reduces the system to a few key intercity routes. Unfortunately, not all the routes listed here are even all-day, much less frequent. However, the route schedules do all come in a handy booklet. We can’t recommend OneBusAway enough to bus users. Available both as a webpage and as an app for all major mobile operating systems, this site gives real time arrival information for every bus stop in King County, and some neighboring counties. Due to weaknesses of Metro’s data reporting, there are inaccurate quirks, in particular near the beginning of routes, and times where it reports “scheduled arrival” instead of actual arrival. Nevertheless, it is absolutely indispensable to heavy transit users. If you’re riding the light rail or Sounder commuter rail, look for the ORCA readers (pictured at right) that are somewhere in the station, usually well before you get to the tracks. 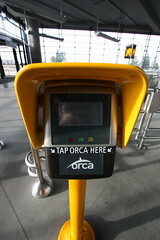 Make sure you “tap” (holding the card over the ORCA logo for a second or so, until it beeps) both before and after using the train. The Seattle Streetcar uses the same yellow readers, but you only need tap it before boarding, not after getting off. On the bus, it’s kinda complicated. If you’re using a RapidRide route (A, B, C, D, E, F), and there’s a yellow ORCA reader at the stop you’re using, tap it before you board. 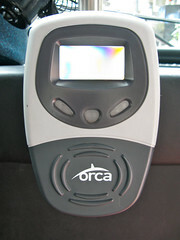 Under all other circumstances, board the front door of the bus and tap the ORCA reader to your right (pictured at left). It’s pretty much impossible to board the monorail without passing the booth that sells tickets. At non-peak times, tickets are sold as you board the train. If you’re interested in transit as a tourist attraction in itself, read this. The Trailhead Direct service connects major transit hubs with some the best-known hiking trails in the Cascades on popular weekends and holidays. It can be very difficult to park at these trailheads, and we encourage you to take transit. The Museum of Flight is the best aviation museum on the West Coast, and the 124 drops you off in front of the door. The Boeing Plant tour is in far-off Everett, but is totally worth it. Your best bet is to take Route 512 to Everett, and then switch to Everett Transit Route 3. Bainbridge Island has a neat, walkable downtown and is reachable by ferry from Colman Dock, indicated on the map. The ferry ride is half the fun. If you desire a shorter boat ride, the West Seattle Water Taxi can get you to Alki Beach, which is a hot spot in summer. It takes some patience but you can access many ski slopes via transit. Tacoma’s downtown has a lot to do, and there are many express buses as well as peak-only commuter trains to get there. You can use transit to get to the San Juan Islands if you time it right.